Recent reports confirms that the entire family of Karunanidhi and DMK party benefited worth Rs.200Cr from 2G Spectrum scandal. The arrest of Shahid Balwa by CBI has revealed some documents in connection with the fund transfer of Rs.200Cr. to Kalinger T.V. Since the pressure from oppostion parties for JPC that may again rock the parliment in the current budget session in Feb.2011.The Congress is trying to playing a safe mode to resume the parliment for budget session by activating the CBI to get full details of the case. Coming days will give more politicians, businessman names in the 2G scam scandal which was withheld/ delayed by UPA Govt to safeguard the DMK. 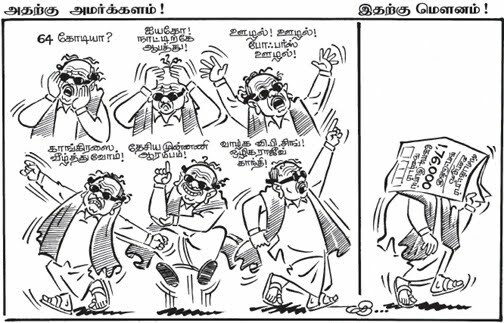 Srinivasan thanks for bringing this post to the forum with a great cartoon support which i really enjoyed. On the day when Raja was arrested that news was never carried in that tv. Then itself i smelt a foul in this episode and now it is proving to be the fact. The raids on this tv office is the testimony.